The competitive landscape of blood gas and electrolyte analyzer manufacturers is extremely consolidated, with the top three players taking more than three-fourth of the total market value in 2017. Radiometer Medical ApS led the market at the time, followed by Siemens Healthcare and Instrumentation Laboratory. Radiometer Medical ApS has consistently held the top position in blood gas and electrolyte analyzer production and sales through a broad product portfolio and a high rate of market penetration. A common trend shown by all top players in increasing their production and R&D efforts in point-of-care devices, according to Transparency Market Research. While these device types will not entirely replace the conventional tabletop analyzers, they will be used across a much wider application spectrum. It is only one of the major changes that have occurred in blood gas and electrolyte analyzer technology recent times. The adoption of point-of-case diagnosis in healthcare, for instance, has allowed these devices to attain an important position next to patient beds. Additionally, blood gas analyzers are becoming increasingly smarter and more synchronized, allowing them to help maintain patient record management a lot easier. One of the key restraints to the growth of blood gas and electrolyte analyzers still remains to be the use of badly calibrated blood gas analyzers, especially the portable ones. Their use by inexperienced non-laboratory personnel significantly increases the changes of the devices going without regular maintenance and recalibration, creating a large scope for error in diagnosis. Another issue that blood gas and electrolyte analyzer companies are struggling with is to resolve the issue of personnel using faulty samples. The two leading causes of misdiagnosis through blood gas and electrolyte analyzers is to use arterial blood with air bubbles or the use of mixed venous blood or even venous blood. North America held the leading revenue collection in 2016 and 2017. By the end of 2017, the North American region had produced a revenue of US$683.0 million, and is expected to progress at a CAGR of 8.8% between 2017 and 2023. This is the top growth rate among all geographical segments for blood gas and electrolyte analyzers and will therefore maintain its leading position till 2023. Combination analyzers and consumables are expected to contribute a huge chunk of revenue of blood gas and electrolyte analyzer players by being propelled at high CAGRs. Revenue generation of consumables such as electrolytes and electrodes is expanding at a strong CAGR of 11.9% from 2017 to 2013. 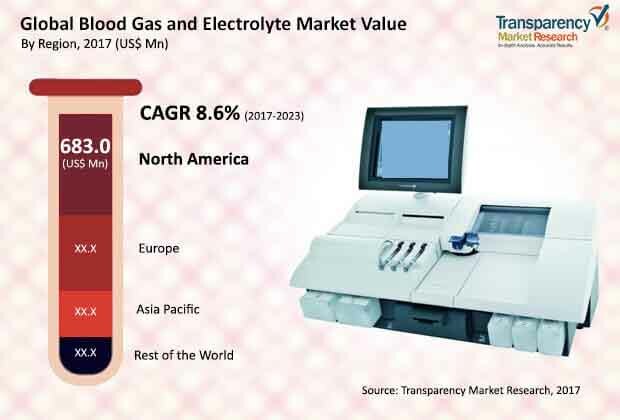 The global blood gas and electrolyte analyzer revenue generation is expected to expand at a CAGR of 8.6% between 2017 and 2023. The total revenue expected by the end of 2023 is US$3,480.3 million. US$1.1 bn is the projected revenue from combination analyzers by 2023. Integration of wireless technology is expected to be the next big step in blood gas and electrolyte analyzers. 36% is the expected revenue share of North America by 2023.